I had fun playing with my Ketto's Pot O Flowers with that challenge in mind... I'll have a new flowery creation for you next Friday! After coloring my image, I went back and added my black glaze pen to each of the polka dots on the pot for a little extra "oomph." This is the card that I used to put together a little bow tying tutorial. I get lots of questions about my Buttony Bows, so I thought I'd try to show you exactly what my process is. My first hint is a nice firm ribbon that will keep shape, and my second hint is to use a LOT of it. Being stingy with the ribbon will make it super hard to tie, and come on, we all hoard the stuff, what good does it do you on the shelf, put that goodness to USE! I'm known to fuss and fuddle with these a lot to get them to look all floofy and "just right." But on the video I show you how I fiddle with them to get them exactly how I like them. Its strange listening to your own voice and all, but I hope this is helpful to you all. I'll get working on another fun thing I like to do with ribbon, a faux bow. I've also uploaded to You Tube if that is easier for you. You can find it HERE. Now, I'm running and hiding because I'm embarrassed. Be kind, okay? It's soooo much easier to follow than a picture tutorial. I don't know why you're embarrassed - it's fabulous!! Thanks so much!! I agree, you have no reason to be embarrassed...your first one? It's fantastic and thank you for sharing! LOVE your bows! And our DH's just dont get it, but they do get me tickled in their way of thinking of our stuffs, rofl. I know how you feel! I just loved your video. You sound just like I thought you would!! Next time, I want to see your pretty face, too. Great Bow tutorial. Definitely going to practice that technique and see if my bows start looking a little better. GREAT video; you did a fabulous job. Thank you so much for taking the time to record such an awesome tutorial and for sharing your technique... I can honestly say your bows are the best I've seen and can't wait to try it myself! WooHoo!! THANK YOU!!! I wanted to see that! LOL Now honestly... I did try one. Though it was NOT as impressive as yours! LOL It's on my blog under.. the DT Call article, I believe. Tell me what I did wrong!! LOL LOVE it though. Where do you get your twin? SU? 1) Velcro: It’s not as easy as it looks. 2) ATMs: Do those new Bank of America machines leave you bewildered? 3) Gas Stations: Using those self-service stations can be perplexing! 4) Toilet paper dispenser: Looks simple but, it’s not. There’s a reason why 9 out 10 never get refilled. Joanne you are adorable, I loved the tutorial, and your hubby cracks me up. I am now expecting the tutorial on how to fill the tp dispenser so I can show it to my entire family!! Love your cute card! Off to listen to your tutorial! I think you are a doll and I ADORE your bows! Thanks for the video tutorial! It was great and very helpful! Hope to see more in the future. Thanks for sharing your creations with us on a daily basis! You're a great source of inspiration! 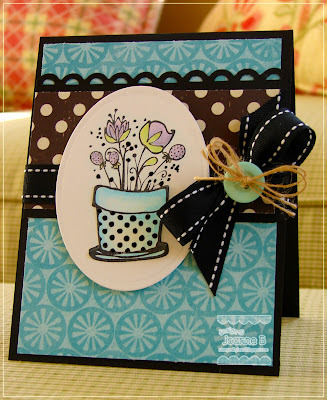 I like you blog... cute cards on there can't wait to see more. and get know you better. Fabulous card and I love your video!!! Well done my friend!!! Thanks! Love your buttony bow. And I always love hearing people. You get to "know" them just a little bit better. Fun! Wonderful instructions! Easy to see and understand too! Thanks for sharing! I just did my first tutorial too but I chickened out and just did photos hehe. I'm anxious to try these! Thank you for the tutorial! Looks great! great video!! thanks for the tips! Your video is great - I will have to give it a try, especially because I today my PTI goodies arrived, including twine, along with a few buttons :>)!! If you run out of twine start heading south on the tpke and I will meet you at the MA border! I think your bows with the button is adorable. I just found out about the candy but I'm getting started on my card. I will be useing that more often, I truly liked it. Thanks. You did a good job with your video. Your husband sounds like he would be fun to be around. The kind that likes to keep people laughing. See ya soon. I've got a card to work on. This was definitely a helpful tutorial...thanks for taking the time to share it!! That is a great tutorial! Thanks so much for sharing it ~ I know it takes a lot of time & effort to put something like that together~ I appreciate it! Ok, Joanne, first, don't be embarassed. Second, that tutorial is fantastic!!! Now I get it!!!! Just got to make my hands cooperate with my ribbon. Absolutely wonderful instructions - I am off to practice - thanks so much! Great tutorial - you made it look so easy. I am going to go and try it out now. Thanks so much for sharing it with us. It's a great tutorial, stop running!!! I love the bow, thanks from all of us that are challenged with this. Thanks you so much for this tutorial! It is amazing! Can't wait to make some bows! THanks for a great tutorial!!! You sure have a passion for bow!! your a pro!! Thanks for sharing. Thank you so much for sharing!!! :) Your bows are BEAUTIFUL! Please don't think I'm crazy, but I'm more of a chemist than the creative type. How many inches of ribbon do you start with (for an A2 size card)? Great tutorial,lesson learnt,I skimp on my ribbon! where do you find the scrummy type of ribbon that you've used here? I was just having problems with a bow last night..luckily today I hopped over the ThePaperLandscaper to view all her projects I've missed over the past week or so AND she had a link to this post! I loved your tutorial, am going to keep it on hand when I go to make my next bow. Love your blog, will have to check it out in more detail!